Basel - Juan Martin del Potro fought off fatigue to win a battle of former champions 6-4, 6-4 over Marin Cilic and reach a third career final at the Swiss Indoors on Saturday. In Sunday's final, the Argentine fourth seed will face either Roger Federer, who has won the title seven times in his hometown, or Belgian David Goffin. Del Potro won his previous titles at the St Jakobshalle in 2012 and 2013 at the expense of world number two Federer. The Swiss has been powering through the week as he tries to overhaul rival Rafael Nadal to finish the year as world number one. The battle is provisionally scheduled to continue next week at the Paris Masters, but Federer will be making a late decision on whether to take up his second-seeded position at Paris Bercy at the end of his Basel week. 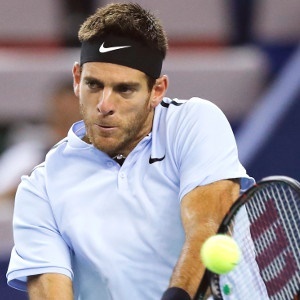 Del Potro, who played a Shanghai semi-final a fortnight ago and won the Stockholm title last weekend, admits that he is tiring, but intends to carry on. The Argentine claimed his 10th win in 12 meetings with Croatian Cilic, the reigning champion who had spent just over three hours on court on Friday in putting out Hungarian qualifier Marton Fucsovics. Del Potro has now won his last seven meetings with Cilic, who was the losing finalist to Federer at Wimbledon. And he makes no secret that he is keen to face Federer for a third time in a Basel final. "I'd love to play Roger again at his tournament, I know the crowd wants him in the final," said the 29-year-old. "I'm happy to be in the final, I hope to play good tennis for the crowd and for myself. "Not many players can beat Roger, the greatest in history," Del Potro said. "It's always a pleasure to play him, and to do it in his hometown is amazing." The Argentine took 45 minutes to win the opening set against Cilic, the second seed. A break in the penultimate game of the opener followed by a hold from 0-30 down gave Del Potro the lead. In the second, the South American broke early but lost his serve in the sixth game, as Cilic levelled at 3-3. But Del Potro gathered his resources to break straight back, finishing off victory with his seventh ace of the afternoon.